A photograph of the intersection of Broadway and Osborne Street during the 1950 flood in Winnipeg. The photo is taken from Osborne Street, looking north; the stone cross of All Saints' Church can be seen near the left side of the image. 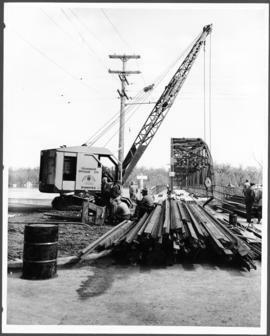 A photograph of the downstream Osborne Street Bridge during the 1950 flood in Winnipeg. A photograph of floodwater and sandbag dikes outside 368 and 372 Main Street during the 1950 flood in Winnipeg. A photograph of floodwater and a pump outside the Royal Bank on Main Street during the 1950 flood in Winnipeg.